My canine companion Buddy does it. Almost every time he wakes up from a nice, long nap, he sticks his rump up in the air and stretches his paws out with a look of bliss on his furry little face. 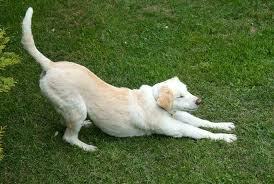 But did you stop to consider how we take lessons from both animals and nature in our yoga practice? The “Down Dog” or “Downward Facing Dog” position teaches us the push-pull dynamics of yoga where movement in one direction is balanced by action in the opposite direction. Although this pose, otherwise known as Adho Mukha Svanasana (no worries; I won’t make you pronounce it…), is a comfort/joy position, but if you find it to be a challenging one, please be compassionate and patient with yourself. Tight hamstrings or weak arms are not uncommon among us. Once you master the Downward Dog position, however, you’ll start to feel so good that you will want to get down on the floor with your pooch and join in the communal stretch. An important element about this pose is learning to ritualistically place your hands in alignment with your shoulders and hips. New students tend to place their arms too wide and their feet too close together, making their base unstable, their joints stressed, and their organs compressed. As you lift your pelvis to the ceiling and draw your hips back, make sure that your feet are hip-distance apart, aligned with your pelvis, shifting your weight back. That “Aha!” moment will occur when your weight is centered in your pelvis, and your arms feel light. Getting there is part of the process. The most important thing is, of course, to breathe. Broadening your shoulders and extending your arms brings more space into your lungs. 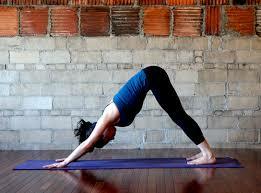 And exhaling can take place as you focus on the movement of your legs back and down through your shins and heels. This pose is nourishing, invigorating and relaxing all at once, which is why I tell students to go there as a “safe place” (like child’s pose) when they choose not to follow my verbal prompts. It is also the starting point for Vinyasa Flow movements — kind of like home plate.